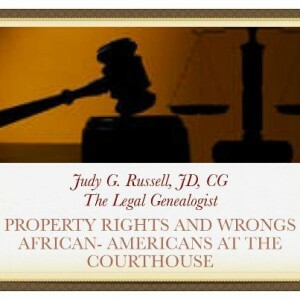 Tonight at 9 p.m. EST, Bernice Bennett, host of BlogTalkRadio’s Research at the National Archives & Beyond, and The Legal Genealogist join forces for Property Rights and Wrongs: African-Americans at the Courthouse. This free one-hour online radio program deals with the enduring reality that the history of slavery in the United States is written in the court records — but not the records of people. Instead, clues can be found for descendants of slaves and slaveholders alike in the records of property. Slaves were bought, sold, borrowed, leased, given away, willed and fought over, and court records capture those as transactions involving property. And long after the Emancipation Proclamation, the legacy of people-as-property has been written in the legal records: because the freedmen lacked property, their children were taken from them; because they lacked the means to buy land, they ended up as sharecroppers or seized as vagrants and auctioned off to pay their jail debts; because they lacked lawyers, even legally-acquired land was lost. Clearly, from being treated as property to having their property stolen by those who used the law against the freedmen, African Americans’ experience at the courthouse had only one bright spot: it created records for the genealogist-descendants of slaves and slaveholders alike. This internet-based broadcast — Property Rights and Wrongs: African-Americans at the Courthouse — is free to all. You don’t need to register, you don’t need any special hardware or software, and we’ll get underway at 9 p.m. EST / 8 p.m. CST / 7 p.m. MST / 6 p.m. PST. Hope we’ll “see” you tonight.